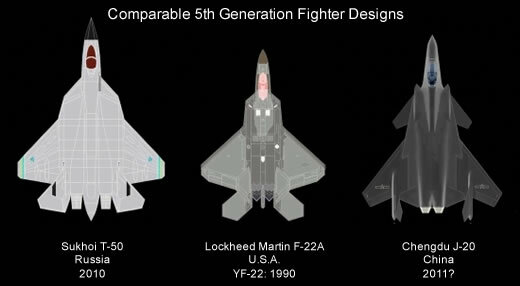 From the Heritage Foundation blog, some disturbing news about fifth generation fighter technology. The chief of Russia’s air force announced this week that the PAK FA, Russia’s fifth-generation stealth fighter, will enter service in 2015. This would be close to the time when two U.S. F-35 Joint Strike Fighter variants for the U.S. Air Force (F-35A) and the Navy (F-35C) are expected to attain initial operational capability in 2016. This display means the U.S. must keep its own Joint Strike Fighter program on schedule for production. The public flight of a PAK FA’s T-50 prototype before the world, at the MAKS–2011 International Aviation and Space Salon, is a demonstration of Russia’s firm commitment to develop this aircraft for its own use and to sell it around the world. Russian authorities have declared that they intend to acquire 60 PAK FA aircraft by 2020. Russia’s stated objective is to acquire 250 fifth-generation aircraft, but more are possible. India would acquire at least 250 and up to 300 of its PAK FA version, the Fifth-Generation Fighter Aircraft. […]Congress should consider the implications of Russia exporting this stealth fighter to other nations. In addition to India, Russia could sell the PAK FA to Iran if the U.N. arms embargo is lifted, or to Arab countries if the U.S. refuses to sell them the F–35, as well as to Venezuela, Vietnam, Indonesia, Malaysia, and perhaps even China, since the PAK FA appears to have more internal bomb capacity than the J–20. The J-20 is China’s 5th generation stealth fighter. Meanwhile, the Obama administration has shuttered production of the only thing that can stop these Russian and Chinese fighters – the F-22 Raptor. And the Democrats would love to cut anything else they can get their hands on in order to buy more votes before the 2012 election. It’s like putting drug addicts in charge of a bank vault. They love power, and they’ll do anything to get their fix in the short-term. While having the greatest fighter jets is a nice feather to have in the cap, it’s not an end goal in itself. If any one of those countries you list gets the new Russian jet, it doesn’t mean then that they would own the air in a war with us as they still wouldn’t have technologies like cruise missiles that can still take out the runways needed to launch those planes (or take them out while they’re grounded). Additionally, a stealth plane is not invisible on radar, it just has a very small radar signature an in a war situation against a country with stealth technologies, small signatures aren’t ignored. So since we now know that simply having a stealth fighter doesn’t make you a superpower, how do you propose paying for these very expensive planes…maybe we up our defense spending from trillions a year (700+ billion for normal defense + war expenses + military equipment replacment costs + GI benefites + ect) to even more trillions? Well, I’m not surprised that someone with an IP address from Pyongyang would say that. After all, I’m sure that you would love to get your hands on a few squadrons of T-50s, you big commie! And some T-90 tanks, too. My uncle had tested out the T-90 (I believe it’s the one) when they captured some in Iraq to compare it to ours. He had said it was quite impressive but still not on par with what we have.